This site launched in 2001, when myself and many new internet friends started to get reacquainted with the fine art of knitting. With its knitting blog, project diaries and then pdf knitting patterns, Studio Chic Knits has evolved into a collection of many resources for all of us new millennium knitters. My background includes training and commercial work in fashion, photography and graphic design and soon those skills merged with my passion for fiber, fit and finish. The Goal: simple, wearable styles that had great proportions and clean detailing. Take a look around - I hope you enjoy the tips, complimentary patterns and the peek behind the scenes in the studio on the knit blog. I'd love to meet you in person - get the latest about events and classes with the Chic Knits Newsletter here. 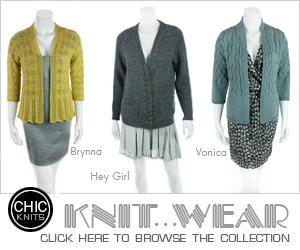 knit & wear in good health! Please drop us a line at the above email if you have a question about a transaction, pattern help or other needs.